Almost up to the front page! Presentation matters. Everybody says it, and it’s true. Get your cover and your product description as polished as humanly possible. What you’re watching for is a visceral reaction when you show someone. My cover and my description have gotten some big reactions—people exclaim or jump up or lean forward. They’re my friends, but the key here is that I watched people go from just being happy for me to being genuinely excited about the book itself. It’s beautiful and intriguing and it looks like the real deal. That added a whole different energy to the launch. Set a clear goal and communicate it. For this project, I’m not mainly focused on sales numbers. My goal is to get 25 Amazon reviews within 1-2 weeks of release. I have mentioned this over and over, on Facebook, in person, on the blog. Basically any time I tell people the book is available, I tell them my goal as well. This works on a lot of levels. A review (especially a good review early on) is a lot more significant long-term than a sale. With the pre-order discount, I get about 35 cents per sale. But say you’re browsing on Amazon. Think about how differently you’d approach a book with dozens of fairly high reviews and a book with one or two reviews, or none. The latter looks bare and amateurish, and you have no way to get a sense of the book’s quality and content. The former looks well-established, fairly popular, and has plenty of reader experiences for you to connect with as a potential reader. But this goal also gives my readers and friends a project to get behind, something that’s beyond just me and my sales numbers. It gives us something to push for together, a message to pass on, a sense of purpose, and (I trust) a big moment to celebrate together in the near future. It’s a great way to bond with readers and add energy to the launch whlie building a solid foundation for future sales. 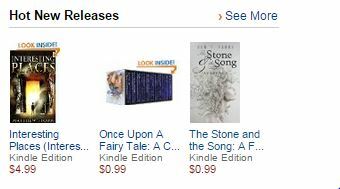 The Stone & the Song hits Amazon Hot New Releases! Be available. I made a quick Facebook post announcing the pre-order and a minimal blog post, then didn’t touch it all day because I have a day job (and no smartphone). I have amazing friends, so within 4 hours this still became the most-seen and most-clicked announcement I’ve ever made, but Bitly and my more-connected friends both told me that the action died down around 11am. I bet if I’d been able to check in periodically, even just for brief thanks, likes, and answers to some questions/issues that arose, it would have maintained a slow burn throughout the day and helped the word spread even further than it did. Fresh eyes. I sent the final version to Amazon at 2am after a grueling day and night of post-production—writing marketing copy, arranging final layout, tiny corrections, check, tiny corrections, check again. Needless to say, my brain was mush, and I ended up missing a pretty glaring issue on the front page. Luckily a friend caught it early on, but probably better to sleep on it, get another pair of eyes on it, and then post it for the world to see. Slow and steady. I got 20 pre-orders the first day. What excited me far more was that I had 5 more a few hours into the second day, up to 8 around noon. While I’m incredibly excited and grateful to have such loyal and vocal friends, one of my big fears is that I’ll tell them about my book, they’ll all buy it, and that will be the end of it. My second-day pre-orders are an indication that I might be setting up for sustainable sales, not just a flash in the pan. I used to think in total sales, but I’ve found that the more meaningful metric seems to be sales per day. It’s not really about getting a big crowd to do something; it’s about establishing the visibility and credibility you need to consistently keep drawing new readers. My friend Bill has a great analogy about rolling snowballs; the bigger the initial snowball, the easier it is to get momentum, but the real point is to get the ball rolling so it keeps growing. Your crowd is your initial snowball, but the win is to get a steady stream of new readers too. To assist with this, I’m actually staggering my announcements a bit. I’m going to be sending emails to potentially interested friends-and-relations who maybe didn’t see it on Facebook, and telling different circles of friends as I naturally run into them. From what I hear, this may also help maintain a higher or more stable sales rank, since Amazon now looks for sustained sales rather than raw totals. Keeping the readers I get. The book includes a sneak peek of my next novel and links that make it easy to read more, sign up for my mailing list, or support me on Patreon. I’d love to get this book to as many people as I can, but I’d especially like to find the people who like it and the sample enough to stay in touch. So that’s what I’m finding so far. What about you guys? Any interesting questions or findings or ideas for me? 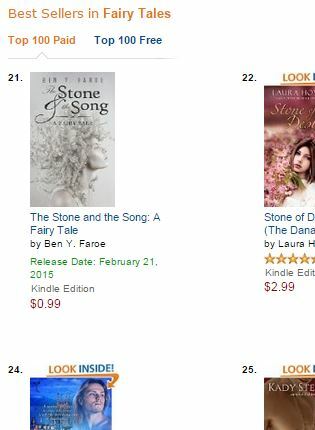 ← Pre-Order The Stone and the Song!